Frito-Lay’s Tostitos brand is all about bringing people together for the Super Bowl, but the brand needed a new way to tap into the buzz before the big game in 2018. While that requirement may be typical of any brand that advertises during the Super Bowl, Tostitos had a less-than-Super-Bowl-requisite budget of $850K and had the added difficulty of needing to reach the demographic that cares the least about pro football: Millennials. While Millennials may be increasingly apathetic toward the NFL, the one thing they do love is a good old Super Bowl spot. 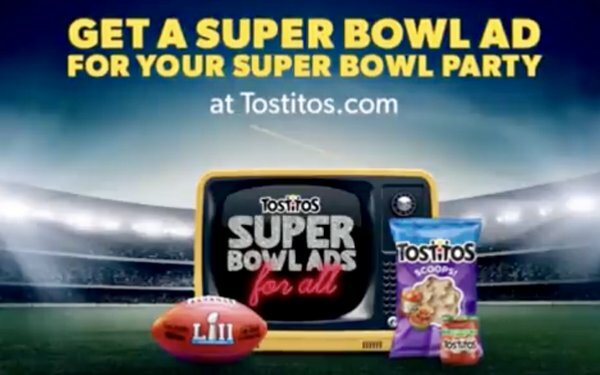 As most brands went big with splashy 60-second TV ads, Tostitos did the opposite: instead of making an ad for itself, it made an ad for people throwing Super Bowl parties. GS&P created a microsite where party hosts could create personalized 60-second ads promoting their own Super Bowl parties. The customizable digital invite generator included dozens of mix-and-match Super Bowl ad clichés such as two senior women asking “Where’s the party?,” reminiscent of Clara Peller asking “Where’s the beef?” for a 1984 Wendy’s ad. The ads also featured a favorite throwback celebrity, Alfonso Ribeiro, better known as Carlton from “The Fresh Prince of Bel-Air” (because what kind of Millennial campaign would it be without a nostalgia-inducing celebrity?). They used their media budget to follow up with guests, reminding them of the party and offering a BOGO coupon for Tostitos dip. In the end, Tostitos reached its audience not by spending millions on a 60-second spot, but by turning the spotlight on its fans and making their parties the stars of Super Bowl Sunday. 915 million media impressions, nine times more than a Super Bowl ad generally reaches. Target Millennials where they live, on social, in lieu of a TV spot. Leverage pop culture references to create connections and humor with media-reared Millennials. Use dynamic creative to personalize not only messaging but interactivity and redistribution. Make advertising utilitarian — a way to enhance what people already want to do, not just what advertisers want them to do.